Unpaid intern discontent was surely going to give rise to the dark thriller Shane Kuhn has written. In fact, it’s surprising that something similar has not already played out on one of the many serial crime shows. The book outlines the last assignment of an intern who is really a hired assassin sent to kill one of the partners at a prestigious New York law firm. As 25-year-old John Lago prepares to retire his role as assassin, he outlines everything he learned from founder of Human Resources, Inc. (HR, Inc.), Bob and the countless assignments John completed in seven years. HR, Inc., posing as an office intern placement agency, is really a training organization and source for hired assassins. 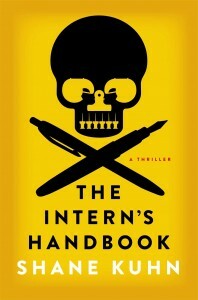 John writes this handbook partly for nostalgia and partly as a service to the assassins just beginning their careers. Though “not part of the new hire welcome packet . . . there’s a good chance this handbook will save your life.” Through the novel readers discover just why John became an assassin, and what is driving this last assignment to be so unusual. While at first the book seems like an unpaid interns fantasy written after hours, fueled by Top Ramen and Red Bull, the story line works because of Kuhn’s diligence to maintaining a semblance of probability. For example, why does John have to retire? The realism doesn’t stop at his choice of LensCrafters or how to make the best cup of coffee; he delves deeply into the psyche of why John Lago and the other interns were selected for HR, Inc. Many of the people who work for HR, Inc., like John, have a history of neglect and violence. This description perfectly sets up the relationships John forms in the book and how he even narrates with a semi detached stoicism, sprinkled with stories of previous assignments, hinting at the thrill of the kill developed over the years. The fight scenes, while a bit clunky in their style, are not nearly as gruesome as scenes in the Girl with the Dragon Tattoo series. The level of violence mixed with personal intrigue strikes a great balance for readers who want a thrilling ride in the world of assassins, without the kind of images that make you stop sleeping. – I originally published this review on The NY Journal of Books.